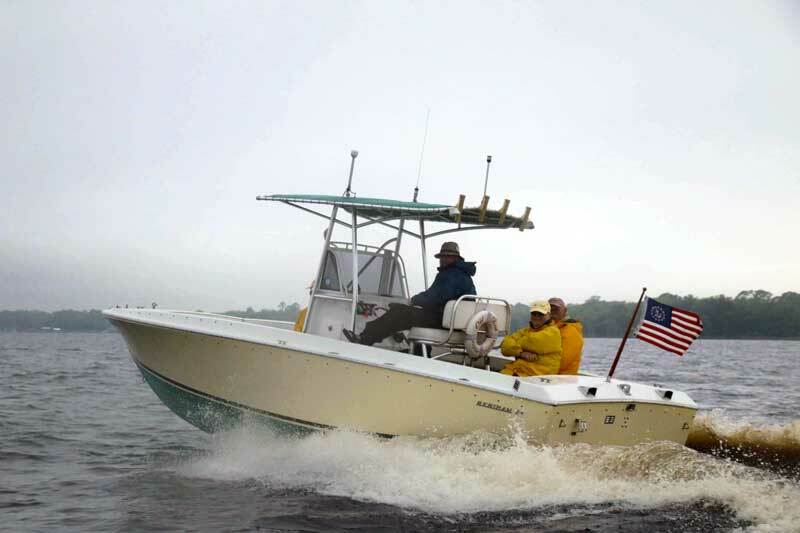 She is a 24-foot Bertram center console. Or is she? Actually, Bertram never made a 1970 center console. But it did build a few 24-foot Moppie Camper cuddy cabin boats that offered a unique feature. Via a hinge at the front of the deck, a five-foot-long section of the fiberglass deck opened up to a 45-degree angle in front of the windshield, creating nearly seven feet of headroom for the companionway entrance to the cuddy cabin below. This boat style became known as a Pop-Top Bertram. The other end of the five-foot-long fiberglass section was either latched or loose at the windshield and helm area. Screens, weather cloths, and/or eisenglass filled the unique space between the angled fiberglass, the windshield, and the fixed deck area of a Pop-Top Bertram, creating a comfortable all-weather “camper” area. The cuddy cabin accommodations featured berths six feet and two inches in length along with a small toilet, shelving, and storage. Retired Captain Bill Mullin was on the hunt for a Bertram when he found this Moppie Camper. He wasn’t interested in the Pop-Top, but it was a Bertram, so he got creative. He salvaged the Bertram hull plus a center console from another boat. He ordered a T-top from Dave Miller’s Welding in Northeast, MD, and found a leaning post helm seat from another boat, reincarnating it all into the resto-mod he named Old Bert. All of these elements blend so cohesively that it’s easy to presume that Old Bert was born as a center console at the Bertram factory. In her new life—evolving from a boating wrecking yard boat as a Moppie Camper to her current life as a center console—Bill has re-powered her from twin four-cylinder engine to a single Mercruiser/Chevrolet V-8. He used an Alpha drive inboard/outboard sterndrive. Although this drive came with built-in power trim, Bill doesn’t use it when operating Old Bert, nor does he need it. A deep vee without trim tabs? Yes, Old Bert is one boat that matches that specification. We didn’t need trim tabs coming on plane or on top of the water from the six-mile-per-hour speed zone limit. She has a beautiful cruising speed ride angle. A Bertram 24 has a 24-foot LOA with a beam of eight feet. Be careful not to confuse it with a Bertram 25, which is nearly two feet longer (25’ 11”) and nearly two feet wider on the beam (9’ 11”). Although both the Bertram 24 and the 25 typically have twin four-cylinder I/Os for power, the Bertram 25 is otherwise a very different boat. I’ve known Captain Bill for a number of years now. He spends time boating between Pennsylvania and Jupiter, FL. This was the first time I had the opportunity to experience his superb boat-handling skills. Bill skippers a boat so smoothly that riding with him is seamless. From casting off, pulling away from a float, through the no-wake zone and into open water, you can enjoy a running conversation that holds one’s attention rather than being distracted by the action taking place. Bill and I cruised on the Delaware River covering both the Pennsylvania and New Jersey shorelines. Our starting port was Riverside, NJ, (near Philadelphia). We were attending an Antique and Classic Boat Society event that included classic boats, classic cars, boat rides, food, and music: a full day of events and activities around boats and boating as well as collectible cars. With the V-8, the boat is very well balanced in getting on plane (high teens/ low 20s mph), as well as at cruising speed (say high twenties in mph) as Bill opened her up. The location of major weights and the lifting strakes on the 21-degree bottom was perfect. The legendary Bertram stories proved to be true. She runs sweet! 2700 rpm was a comfortable cruising speed. Everything was solid on the boat. The hull rode cleanly on top as she had at lower speeds. The wind cooled us on that warm day, which made our speed ideal. An old advertising slogan for the brand was, “The sun never sets on the Bertram Empire,” and this resto-mod 24 model certainly showed off her design lineage, along with her owner’s design talent, renovation expertise, and skippering abilities.